On June 7, 1982, safe inside the Vatican behind closed doors, for the first time in history a pope and a president met alone. 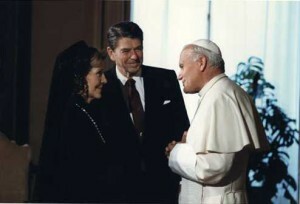 For 50 minutes Ronald Reagan and John Paul II spoke in private. To this day no one knows about what. No agenda existed, no recording was made, no notes taken. And what a pair they made. One man the leader of the free world, commanding the most powerful military and shepherding the most vibrant economy on the planet. The other the spiritual beacon of a billion-plus Catholics, millions of whom had lived for decades in eastern Europe under the harsh yoke of communism. Many books have been written about both men, that fateful meeting nearly always included. Some historians are convinced that a deal was made, an tacit agreement of cooperation, both men having survived an assassin’s bullet, both men sharing a common goal: the end of communism. It’s hard to conclude anything for certain. What we do know is that over the next 6 years Ronald Reagan and John Paul II brought the Soviet Union to its knees. Ronald Reagan knew that the hand of God had brought him here. How else could it be explained? Two years ago he was locked in a bitter primary fight against ten contenders, vying a third time for the Republican party’s presidential nomination. He won that battle and the election, defeating the Democrat incumbent Jimmy Carter and claiming forty-four states. Then fourteen months ago an assassin tried to kill him, but he became the first American president to survive being shot. Now he was here, on the third floor of the Apostolic Palace, at the pope’s private study where the leader of nearly a billion Catholics waited to speak to him. He entered the room and marveled at its modesty. Heavy curtains blocked the summer sun. But he knew that from those windows, each Sunday, the pope prayed with thousands of visitors in St. Peter’s Square. Sparse furniture, the most prominent being a plain wooden desk, more reminiscent of a table, with two high-backed, upholstered armchairs fronting each long side. Only a gold clock, a crucifix, and a leather blotter sat atop. An Oriental rug lay beneath on the marble floor. John Paul II stood near the desk, regaled in papal white. Over the past several months they’d secretly exchanged over a dozen letters, each delivered by a special envoy, both speaking to the horror of nuclear weapons and the plight of Eastern Europe. Seven months ago the Soviets had declared martial law in Poland and clamped down on all talk of reform. In retaliation, the United States had ordered sanctions imposed on both the USSR and Poland’s puppet government. Those punitive measures would stay in place until martial law ended, all political prisoners were freed, and a dialogue resumed. To further ingratiate himself with the Vatican, he’d directed his special envoy to provide a mountain of covert intelligence on Poland, keeping the pope fully informed, though he doubted he’d passed on much that had not already been known. But he’d learned one thing. This cagey priest, who’d risen to one of the most influential positions in the world, believed as he did that the Soviet Union was destined for collapse. He shook hands with the pope, exchanged pleasantries, and posed for the cameras. John Paul then motioned for them to sit at the desk, facing each other, a panel depicting the Madonna keeping a mindful watch from the wall behind. The photographers withdrew, as did all of the aides. The doors were closed and, for the first time in history, a pope and a president of the United States sat alone. He’d asked for that extraordinary gesture and John Paul had not objected. No official staff had been involved with the preparations for this private discussion. Only his special envoy had quietly worked to lay its groundwork. So both men knew why they were there. On this first point his special envoy had read the pope correctly. Yalta happened in February 1945. Stalin, Roosevelt, and Churchill met for the last time, deciding how a postwar Europe would both look and be governed. Boundary lines were drawn, some quite arbitrary, others deliberate as appeasement to the Soviets. Part of those concessions entailed an agreement that Poland remain under the sphere of the USSR, with Stalin pledging to hold free elections. Of course, that never happened and the communists had ruled there ever since. He agreed. “I also believe that Solidarity is the way to end Yalta.” That tear in the Iron Curtain happened two years ago at the Gdansk shipyards, the first non-communist-controlled trade union ever allowed. Now over nine million Poles were members, one-third of the entire workforce. A scrappy electrician named Lech Walesa served as its head. The movement had acquired power, force, and appeal. So much that last December the Polish government had imposed martial law to quell it. And he watched as this novel overture registered. His special envoy had urged him to broach the subject, thinking that the Vatican would be receptive. The pope nodded, seemingly considering what he was proposing. That was far more than Reagan’s people had been willing to do. The State Department strongly disagreed with the tactic, saying the Polish regime was stable, solid, and popular. They provided a similar assessment for Moscow and the USSR. That was another sentiment his special envoy had reported, and what he’d been hoping to hear. Never had a pope and a president conspired in this way, and never could either of them admit it had happened. The church openly forbade itself from interfering in politics. Recently the world had seen evidence of that when John Paul scolded a priest for resisting a papal order to resign a government position. But that did not mean the church was oblivious to oppression. Especially when it hit so close. Which was more proof that God was clearly at work here. At this precise moment in human history the storm seemed centered on Poland. For the first time in 450 years a non-Ttalian, a Pole, occupied the chair of St. Peter. And nearly 90 percent of all Poles were Catholic. A screenwriter could not have imagined it better. The Soviet Union was about to be gripped by a great revolutionary crisis. He could feel it coming. That nation was not immune to revolt, and Poland was the pivot that could send everything over the edge. Cliché as hell, but right on target. As with dominoes, one country falls— they all fall. Czechoslovakia, Bulgaria, Hungary, Romania, and all of the other Soviet satellites. The entire Eastern Bloc. One by one they would drop away. So why not provide a push? He could see that John Paul was listening. He could see that the pope was intrigued. And he meant that. Inside his coat pocket he carried a plastic-coated card with codes that could be used to launch a nuclear arsenal. Just outside sat a military aide toting a black leather satchel that could make that happen. All totaled the United States owned 23,464 nuclear warheads. The Soviet Union stockpiled 32,049. He called them the tools of Armageddon. Just a handful of those could destroy all human civilization. His goal was that they never be used. He hadn’t chosen her at all. Al Haig had made that selection from among his attachés at the State Department. John Paul was right, though. She was young, smart, and intuitive— and he’d come to rely on her judgment when it came to the Vatican. John Paul said nothing, but he could see that his conclusion was correct. The Sandinistas were nothing but Soviet puppets. His people were already working on ways to rid Central America of them, as apparently was John Paul. He wondered if the pope thought he was pandering. Based on his special envoy’s visits he’d been provided with a detailed personality assessment. John Paul valued order and security, preferring to deal in known entities. He lived by reason and thought, in clear no-nonsense terms. He was repelled by ambiguity, impulsiveness, and extremism, always thinking everything through before deciding. But he particularly despised being told what someone thought he wanted to hear. “You and I share a common bond,” he said. John Paul clearly realized the connection. Last year, within two months, both of them had been shot. All three bullets were fired from close range, barely missing their aortas, which would have meant certain death. His lodged in a lung, while John Paul’s two rounds passed right through, yet incredibly spared the vital organs. He’d long thought that every person possessed a divine purpose. A plan for the world outside of human control. He knew that this pope also believed in the power of symbolic acts and the role of providence. The CIA had learned of a connection between John Paul’s would be assassin and Bulgaria, one that led straight to Moscow. The White House had provided that information to the Vatican. True, conclusive proof was lacking, but the idea had been to end Solidarity by ending its spiritual and moral leader. Of course, the Soviets could never afford to be directly implicated in a plot to kill the leader of a billion Catholics. This priest had witnessed Nazi atrocities. Karol Wojtyla was there when Poland suffered that unimaginable horror, working with the resistance. After the war he’d then done what he could to thwart the Soviets as they prolonged Poland’s suffering. By all accounts John Paul was a heroic figure, an extraordinary man, learned and courageous. People drew strength from him. And he was in the right place at the right time with the right thoughts. He saw resolve in John Paul’s strong eyes, which seemed ready for the fight. He was, too. At seventy-one he’d never felt better. His whole countenance had revivified after the assassination attempt, as if he’d truly been born again. He’d read what the pundits were saying. Expectations for his presidency seemed low. In past decades, the sheer weight of the job had annihilated many good men. Kennedy died. Vietnam drove Johnson from office. Nixon had been forced to resign. Ford lasted only two years, and Carter was sent home after one term. Critics called Ronald Reagan a reckless cowboy, an old actor, a man who relied on others to tell him what to do. He was a former Democrat who’d long ago switched parties, which meant he did not fit into any clear political mold. Many feared and distrusted him. Others held him in contempt. But he was the fortieth president of the United States, intent on remaining in office seven more years, and he planned to use that time for one purpose. To end the evil empire. That was exactly what the Union of Soviet Socialist Republics represented. But he could not do it alone. Nor would he have to. He now had an ally. One with two thousand years of experience dealing with despots. John Paul had already visited his homeland once, in 1979. Three million people came to mass in Warsaw’s Victory Square. As a candidate for the White House he’d watched that spectacle on television, while the man in white descended from the papal plane and kissed the ground. He remembered vividly what the pope told his countrymen over and over. And he realized then what the religious leader of a billion people could accomplish, particularly one who held the hearts and minds of millions of Poles. He was one of them. They would listen to what he had to say. But the pope could never be obvious. Instead, the message from Rome must always be one of truth, love, and peace. There is a God and it is everyone’s inalienable right to freely worship Him. Moscow would ignore that at first, but eventually it would respond with threats and violence and the startling contrast between the two messages would speak volumes. And while that happened America would encourage reform in the Eastern Bloc, finance free-market reforms, and isolate the Soviet Union both economically and technologically, slowly but surely leading them into bankruptcy. They would play to the paranoia and fear communism loved to exploit in others, but could not handle on its own. They’d been talking about fifty minutes. Each seemed to clearly understand both the task and their individual responsibilities. Time for the final move. He stood and extended a hand across the table. The pope likewise rose to his feet. The pope nodded and they again shook hands. STEVE BERRY is the New York Times and #1 internationally bestselling author of eleven Cotton Malone novels, and four standalones. He has 20 million books in print, translated into 40 languages. With his wife, Elizabeth, he is the founder of History Matters, which is dedicated to historical preservation. He serves as a member of the Smithsonian Libraries Advisory Board and was a founding member of International Thriller Writers, formerly serving as its co-president.